/nada /zilch only thing we could find is a SKUNK. I was beginning to think TIm is a JINX. Whats wrong with this gas gague readings. Yep somebody needs to look at the gagues better. Best to look at the tank. Yep, out of gas, but only 1 turn from the boat ramp, so the trolling motor did its job. Neuse and the high rise. 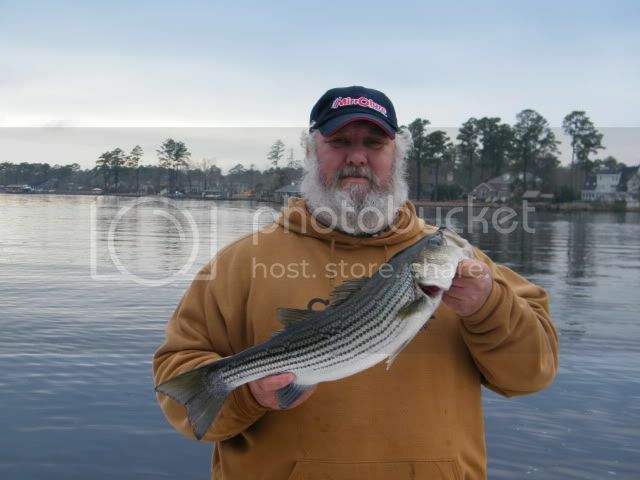 area all of a sudden Tim's heavy rod went to bouncing....oh yea big fish..a few moments later the fish jumped..
..looked like a big striper...oh man..finally get it to where I could see the fish and guess what....hooked in the tail. This fish was estimated to be about 37 pounds. Thanks Tim I had a blast. Hope to catch ya on the water next year. I would be jealous,, if you guys didn't look like your freezing your butts off.. Please excuse my Ichthyological ignorance but what kind of fish is the 37 pounder? A Carp? 10-4 sorry about that...yep nice bugle mouth bass...aka..CARP. It wasn't to bad yesterday weather wise, even got up to about 60. Now Thursday it was tough, heavy frost everywhere, never got out of the low 40's. 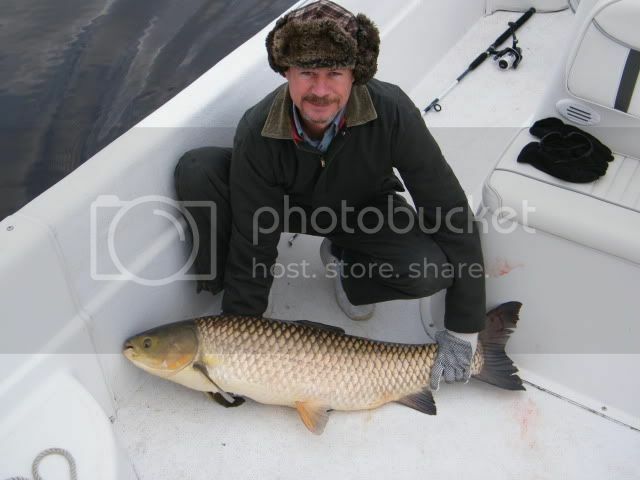 I've spent a little time in eastern Europe, Czech Republic, Hungary, Poland, etc, and over there Carp is a delicacy. They eat it on holidays like we eat turkey and ham here. 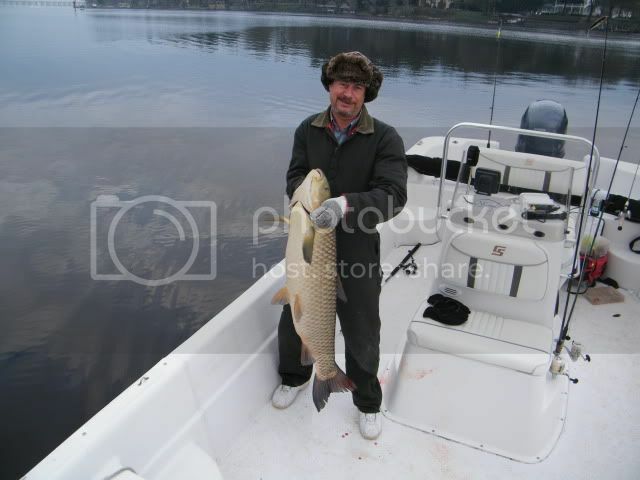 That carp probably has about two dump trucks of PCBs and mercury in it. But at your age it isn't going to interfere with your reproductive success. If you have nothing to do much, then the smaller ones are pretty good when filleted and slow smoked. Of curse if you can catch something better then all the better.